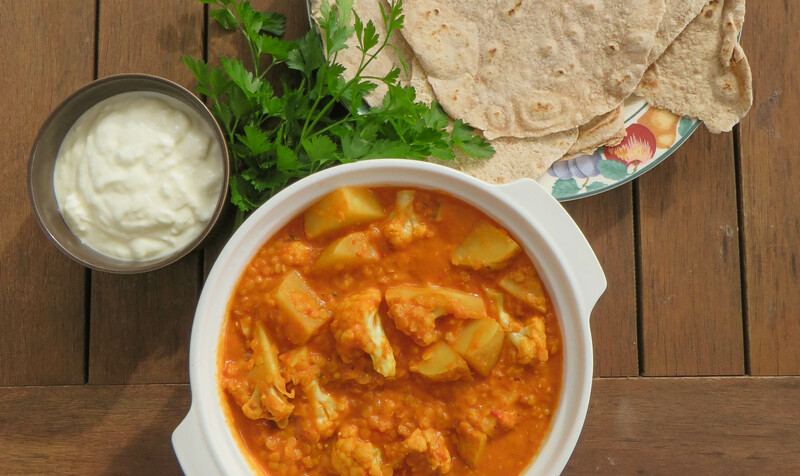 Curried Potato and Cauliflower Dal – One Hungry Thespian. As I’m watching the rain cascade off the roof onto the garden outside it becomes very obvious that the sunny days and ambient temperatures are now gone, off flirting with another part of the world. This dramatic reduction in sunshine and degrees has pulled most of us inside, and with this change in the atmosphere it seems almost necessary that we find our warmth elsewhere. While I certainly could just turn the heat pump on, and in reality it’s been on low all day, there are myriad other ways to bring about a comforting snugness. Comfort food is an extremely personal thing. Some couldn’t ask for anything more than a plate (read: entire dish) of decadently carb-abundant macaroni cheese. You, perhaps, are particularly partial to a bowl of hearty vegetable soup, simmered for hours until the whole house smells just as nourishing and restoring as the soup tastes. What I’ve begun craving -more than I normally do, that is- are curries and dishes with a real depth of flavour. I do love cheesy pasta, don’t get me wrong, and a wholesome soup certainly does have its place, but rather than reaching for creamy indulgence and borderline-glutton richness I’ve been more inclined to want dishes also filled with warming aromatics, herbs and spices. Curries, as a general rule, tick all of the above pre-requisites. I started brainstorming all of my favourite curry dishes to see if there were any similarities or points I could draw upon to make my own ultimate comfort dish. This list, like any self-respecting westerner, included butter chicken -sans meat of course- for its decadently smooth sauce. I played around in the kitchen a little, threw bits and pieces of whatever seemed like a good idea in a pot, and hoped for the best. The result? Well, this. I began by sauteeing an onion and a diced capsicum in a little oil until translucent and slightly golden. I added a chili, several cloves of garlic as well as a touch of coconut sugar for sweetness (also because of this article and a growing desire to caramelise everything I cook). Once the edges started to colour and there was a delicious layer of browning sugars on the bottom of the pan, in went a tin of tomatoes. This, simmered for about ten minutes with another can of water, was blended with whole milk yogurt, tomato paste and a pinch of salt into a sauce that could have rivalved velvet for its smoothness and sheen. Butter-chicken-inspired sauce set aside, I moved onto the real flavour powerhouses of the dish. After adding spoonfuls of whatever spices were available at the time into a mortar, I pestled it (yes, that’s a verb apparently) until I was satisfied that I could justify not working out the next morning. Into hot oil it went, along with enough turmeric to stain the entire town’s wooden spoons. Now time for the filling, I reflected on my prior list of curries. Being quite succeptible to a good serving of aloo gobi, I knew cauliflower and potato were strong contenders. 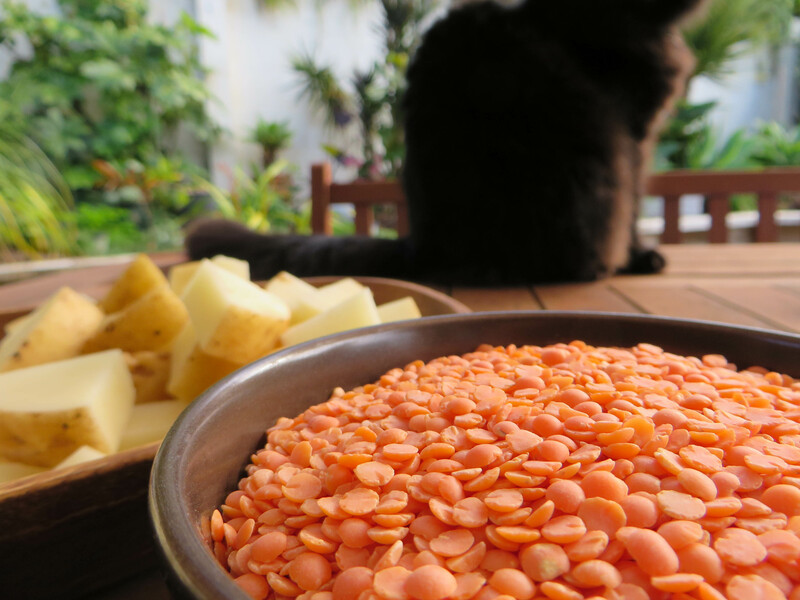 Equally enjoyed, though, was a good red lentil dal, but would it be too much to add legumes as well? Nonsense, I told myself, as I threw in large handfuls of all of the above. Now coated in a heady spice oil, in went the tomato-yogurt sauce and enough water to cover the vegetables and lentils. The hardest part about all of this might just have been waiting for it to cook. This recipe can be easily veganised by using coconut/soy yogurt, or simply with coconut milk instead. If taking the coconut milk route, check the acidity of the sauce as you might need to add a touch of lemon or lime juice to brighten things up. Feel free to swap in other vegetables, too, and adjust the cooking time accordingly. Heat a saucepan over a medium heat and melt the oil, adding the onion, capsicum and sugar once the oil is hot. Sautee for several minutes, then add in your garlic and chili. Once the garlic has started to become translucent, throw in your tomatoes and half a tin of water. Bring back to the heat and let it simmer for 10 minutes, covered. Using a stick blender (or very carefully, in batches, in a jug blender) whizz it up adding the yogurt towards the end. Set aside. In a mortar and pestle grind up the first four spices until roughly broken up. Add in rest of the spices and stir together. Set aside. Heat your oil over a low-medium heat and throw in your spice mix, stirring constantly until the smell hits you in the face and the mix isn’t lumpy (don’t let the oil get too hot – keep it low at first and add a teaspoon of water if needed to cool it). Add in your potato and red lentils, stirring to coat them in the spice mix, and then pour in all of your tomato-yogurt sauce. Bring to the boil and simmer, covered, for 10-12 minutes, or until the potato is just past half cooked. Add the cauli and 2/3 cup of water and bring back a simmer for 10 minutes, this time uncovered, stirring occasionally. 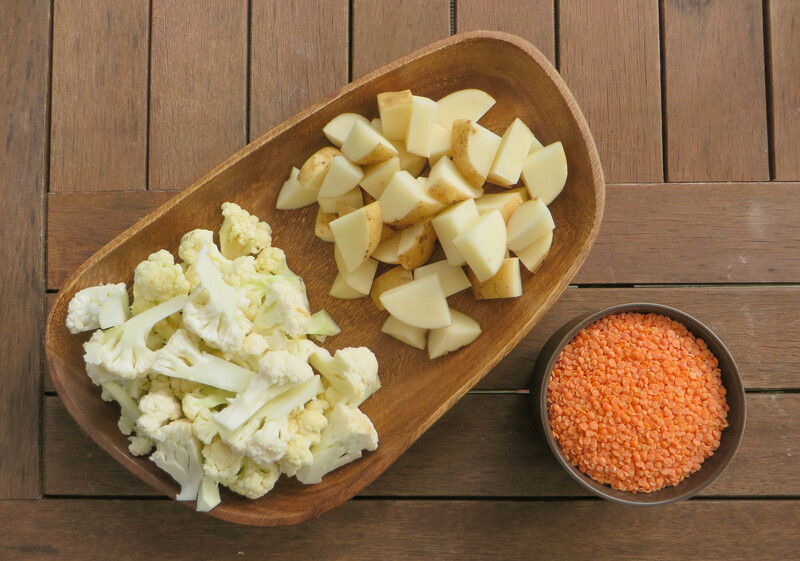 You may need to add water from time to time to loosen it as the lentils swell up and thicken the sauce. 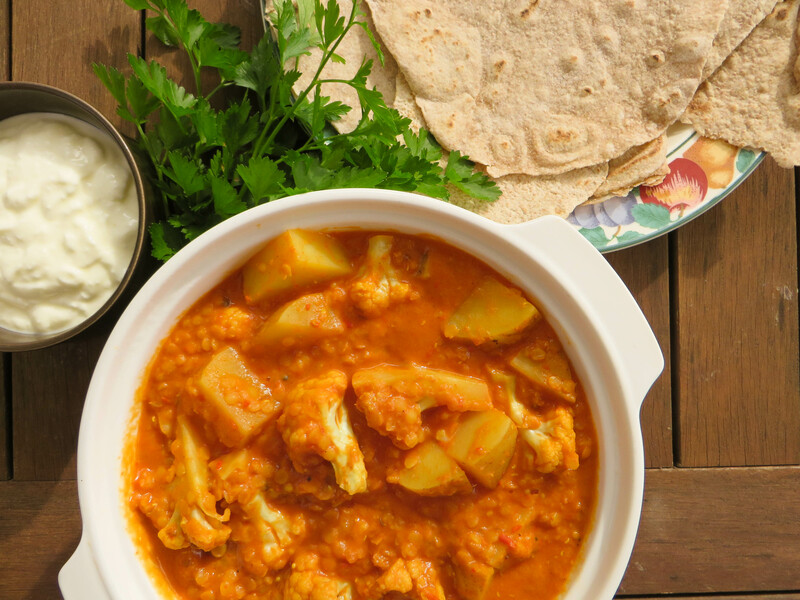 Remove from the heat and serve on top of brown rice or with warm flatbreads + yogurt and cilantro to garnish. Don’t let the long ingredient list or method put you off making this. Chances are you have what it takes to make this in your house right now. If not, use whatever you have and make it work – it’s that kind of dish. In the meantime, I’ll just sit at home in the warmth avoiding having to think about packing (leaving in twelve days? Who me? ).